I talked to the MSPCA Boston..telephone number 617-522-5055. This is where the bird was taken Friday night. It is a lutino ringneck. Thanks so much..they said the bird was fatigued…hopefully it will make it. It’s in a good place although they don’t have a certified avian vet at the moment. 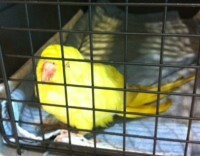 Yellow bird that looks like Budgie, found on Bolton St in Southie. Seemed very friendly and was walking around fine. I brought it to an animal shelter. Please let me know if this is your missing bird, and I will be more than happy to give you more information.